The Costa Children’s Book of the Year 2017. 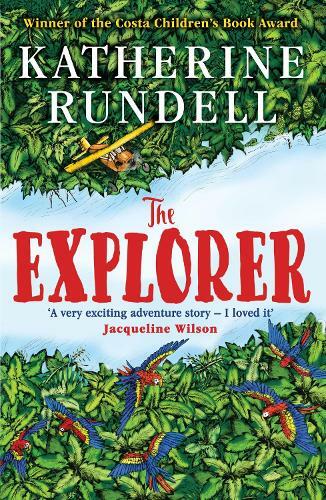 A wild adventure, The Explorer nods to storytelling’s golden age but remains alive and fresh with characters that leap from the page. An instant classic. Like a man-made magic wish the airplane began to rise. The boy sitting in the cockpit gripped his seat and held his breath as the plane roared and climbed into the arms of the sky. From his seat in the tiny aeroplane, Fred watches as the mysteries of the Amazon jungle pass by below him. He has always dreamed of becoming an explorer, of making history and of reading his name amongst the lists of great discoveries. If only he could land and look about him. As the plane crashes into the canopy, Fred is suddenly left without a choice. Katherine Rundell spent her childhood in Africa and parts of Europe before settling in the UK. She is the author of Rooftoppers, a story of one girl’s adventures across the rooftops of Paris, which won the Waterstones Children’s Book Prize and the Blue Peter Book Award. I had seen a lot of press for this title and was fairly interested in it. When Bloomsbury sent me a review copy I was keen to start it. It's okay. Nicely written and the illustrations are lovely, but I just wasn't all that into it. Got about 40 pages in and just ran out of steam.